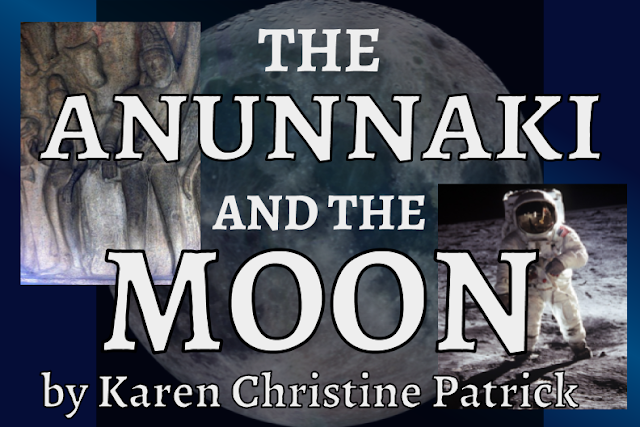 KAREN CHRISTINE PATRICK: BOOK: "THE ANUNNAKI AND THE MOON"
Get Ebook "The Anunnaki and the Moon"
Did the Anunnaki have a presence on the moon? What do the ancient texts say about this possibility? What new data has come to light to support this idea? The ancient story suggests a solar-system wide presence and involvement specifically on the moon. Karen Christine Patrick brings new, interesting photos from unique sources. Patrick is an experiencer, a person who has had contact with otherworldly beings. Karen Christine Patrick was in recruitment as a schoolchild in California in a program called Project Talent, in the late 1960's, that was looking for gifted and talented students. A descendant project from Project Paperclip and MKUltra, Project Talent was a public program with a clandestine agenda, developed as a way to secretly screen public schoolchildren in the California school systems, looking for children with psychic and remote-viewing abilities. Karen's recruitment was interrupted by a mysterious intervention and because of Karen's religious upbringing, she suppressed her "gnosive" abilities. Later in life, not only does she remember many incidents of receiving downloads from the morphogenetic field, but she recalls being in contact with a number of non-human intelligences, including Native American ancestors, an Anunnaki ancestor, an insectoid being, a being on a lunar base, and others. These guides help her throw off the suppression and come fully into using her abilities. The information she receives helps her with a sense of mission she has had since a young child. She is able to know what she needs to know to help catalyze Paradigm Galactic, the state of understanding where humanity knows that Earth is in a populated cosmos. Karen Patrick is a co-collaborator on the website PortalsOfKnowing.com, with unique, original media content, and she has authored a book, "The Anunnaki and the Moon." Karen is the producer of the "Portals of Knowing Show" on Revolution Radio, is a part of the AquarianRadio Network, and collaborates with other producers and talent in the paranormal and experiencer-based radio world. She and her life/research partner, Bret Colin Sheppard, live with their family in New Mexico.